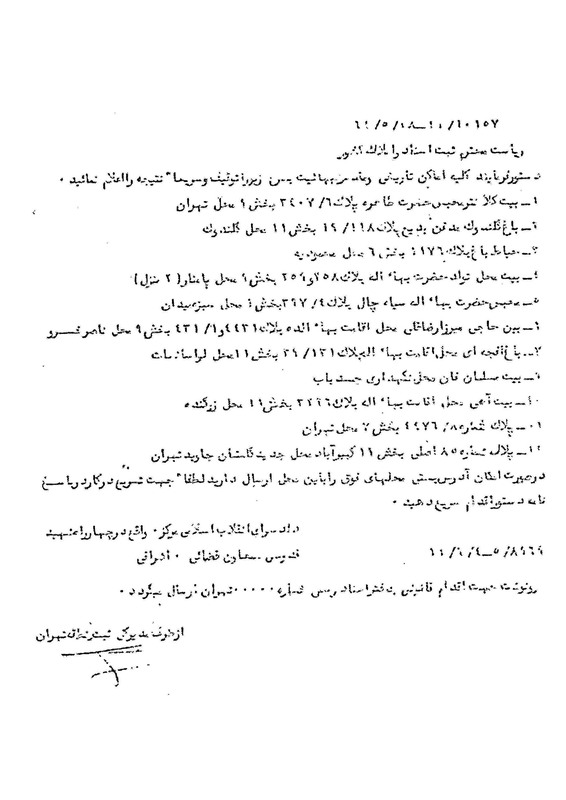 This document shows that based on the order of the Deputy prosecutor of the Central Islamic Revolutionary court and the measures taken by the Director General of the National Office for Registration of Deeds and Properties in Tehran Province, all the Baha’i historical and religious cemeteries, shrines and sites were confiscated in 1361 (1982). Please order the seizure of all of the following Baha’i historical sites and cemeteries, and promptly report the results. 1- The House of Kalantar, the prison of Tahirih- No.3407/6, district 9, Tehran. 2- The Garden of Galandowak, tomb of BADI- No. 19/118, district 1, Galandowak. 3- Hayat Bagh- No. 1176, district 6, Mahmoudieh. 4- House of the birth of Baha’u’llah-No. 258,259, district, Pamanar ( 2 houses). 5- Prison of Baha’ullah, the Siah Chal (black pit) No. 397/4, district 1, Sabzeh Meydan. 6- (Typographical error in the original document) The house of Haji Mirza Gholi, the residence of Baha’u’llah No. 4431 and 431/1, district 9, Naser Khosrow. 7- The Gardeb of Afjeh, the residence of Baha’u’llah No.13/131, district 11, Lavasanat. 8- House of Salman Khan, where the body of the Bab was kept. 9- The House of Ahi, the residence of Baha’u’llah No.3226, district 11, Zargandeh. 10- No. 4476/8, district 7, Tehran. 11- The original No. 8, district 11, Kabir Abad, the new Baha’i cemetery, (Golestan Javid) Tehran. If possible, send the mailing addresses of the above locations to this office. In response to this letter, please instruct to proceed immediately.